Ricerca biomedica, biblioteche e banche dati nel "villaggio elettronico"
D.J. DE WECK, P.H. GYGAX, M.C. CLELAND. P. STANGL, G. LINDER, V. SU. M. EVANGELISTI, M.G. PATRONE, D. UGOLINI. D.R. MORGAN, D. WRIGHT, J. DAWSON. The strategies of World Health Organization Health Literature Services Programme. C. GAMBA, A. CAPELLI, P. RADAELLI, P. CONTI, G. CORTI, R. MARISA. Information gathering behavior of medical and para-professional staff at a teaching hospital. La bibliothèque de la Faculté de Médecine ouverte au personnel soignant. Comment l'exploiter? A. DI DONATO, E. NOVARI. R. TRAUTMAN, S. VON FLlTTNER. S. BAKKER, A. BLEEKER, J. VAN DER BURG, J. DIJKMAN, A.T. HOGENAAR, G. VAN RAMSHORST. The microcomputer as a multiple-use tool. P. LEGGATE, J. VAN LOO. G. BIANCHI, M. GIORGI, L. LIBUTTI, A. VALENTE. V. COMBA, U. MOREGOIA, P. PETRONI. Interlibrary loans considered by a biomedical library. What have the new nordic tools of localization meant to the work in connection with the interlibrary loans? An outline of the "ancient art of the gatherer" and of the foundation of the first obstetrical school in Italy at the University of Turin. A. MIGUEL ALONSO, A. GONZALEZ BUENO. M.F. RIBES COT, M.A. GARCIA MARTIN, M.I. MONTES DEL OLMO. V. EVANGELISTI, P. NINI, A. VIGANO. L. MACCHIARELLI, S. CONTI, G. DI MASCIO, P. TAMBURRINI. J.C. SAMSON, V. CANTARELLO, L. PILOTTO, E. MONTALI. 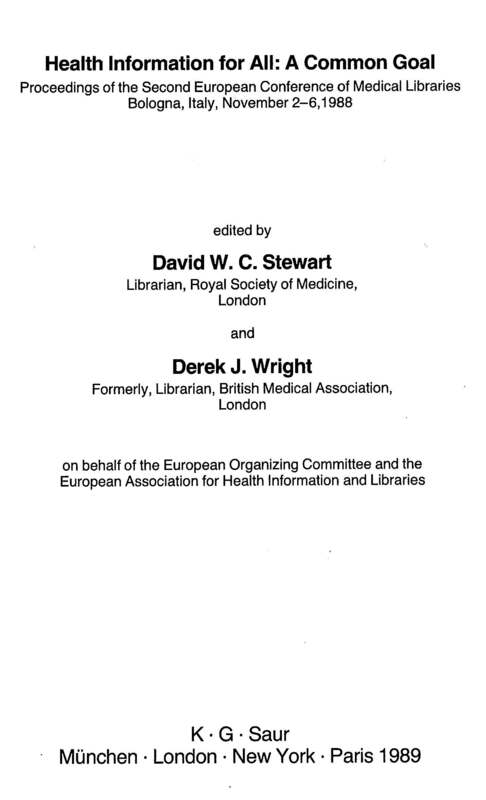 Union Catalogue of Biomedical Serials in Libraries in the Rome area: why a second edition? M.L. AMAT BOZZO, G. SERRA MINA. M. MORENO VERNIS, F. BUJOSA HOMAR. Do you publish "to be read"? Do you collaborate "to be quoted"?